Interests:War memorials, travel, reading, looking forward to retirement! CWGC has him only commemorated on the Tower Hill memorial. https://www.cwgc.org/find-war-dead/casualty/2886411/evans,-jenkin/ Does that mean that the CWGC is unaware of his grave site? "Mr. Jenkin Evans, the Priory, has been killed on board a ship by a torpedo or a mine. He was sent ashore to Whitby and the body was conveyed home on Sunday. The funeral took place on Monday when the Rev. T. D. Thomas conducted the service at the house, and the Rev. D. W. Davies, vicar of Llanrhystyd, at the church and graveside. The chief mourners were Mrs. Evans (mother), Miss Evans (sister), Capt. Evans (brother), Mrs. Evans, Gilfachreda, New Quay (sister), Mrs. Evans, Aberayron (sister-in-law), Mr. Evans (Aberayron (nephew), and other relatives. Great sympathy is felt with the family, and especially with his octogenarian mother. He is the twelfth who has lost his life in this war from Llanon." His burial is noted on Findagrave. https://www.findagrave.com/memorial/130174710/jenkin-evans It is odd that CWGC is not aware of this. It's unusual, but I think I've come across a couple of similar cases where the body of a mariner lost owing to enemy action was recovered and buried, but then commemorated on the Tower Hill Memorial. You could try telling CWGC and see how they respond? 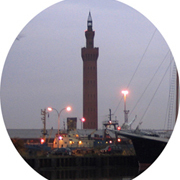 Interests:Grimsby's: Gt. War Effort & Fishing Apprentices. laid for 100 years or more, mostly in unmarked graves or any grave markers there might have been no longer exist, it is more common with seamen. The CWGC usually respond positively with evidence (grave location, death certificate etc), and a CWGC headstone arrives one to two years later if none exist. Member Chris Harley has good contacts with the CWGC and most I’ve found I submit via him. Buried at Llansantffraed Churchyard according to that website linked above by Clive. As Paul points out the parish burial register from the archives would be required along with any other relevant evidence such as the newspaper cutting. Apparently that burial register hasn't been digitised on FMP, so the Ceredigion County Record Office would have to be consulted. Is anyone willing to take this one forward? I will take the deafening silence as a no then. This case will go no further due to lack of the burial register. Sorry, but I no longer approach county archives due to the lack of co operation that I have received. Terry Denham contacted the archives to see what can be found. His name does not appear in the burial register for this location. They think that this is a mistake due to the reports in the newspapers. CWGC have been informed of this. It will now be up to them to make a decision.